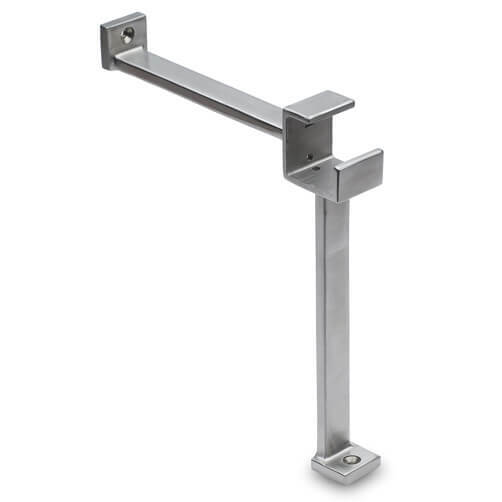 Square profile bracket designed for quick and easy combination mounting, this common style of foot rail bracket is attached to the bar face and floor offering a secure and strong fixing. Fits 35mm square section tube. Countersunk screws are supplied for installation. Bracket manufactured from 304 grade stainless steel with a brushed satin finish. Accepts 35mm x 35mm square profile tube. Two countersunk fixing points for secure attachment. Screws included for direct installation on to hardwood surfaces. Square foot rail is held firmly in place using a grub screw mechanism situated on the under side of the mount. These foot railing supports should never be wall mounted for use as handrail support. 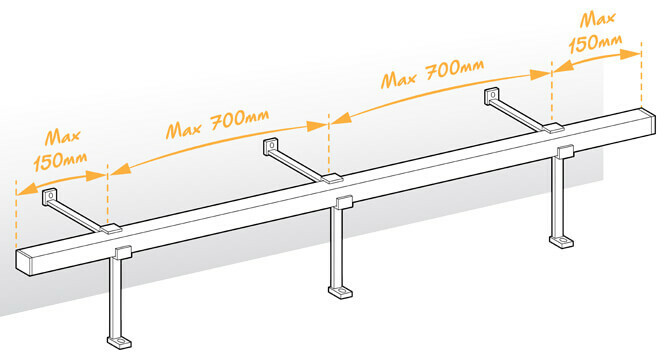 We would always recommend spacing foot rail brackets no more than 700 mm apart. Ideal for internal use and dry environments, offering good corrosion resistance. 1. Start by marking the fixing position of the foot rail bracket, use a few household tools to secure your combination bracket in place with the screws provided (you may wish to use your own screws dependent upon mounting surface). Use a hex head key to release the grub screws situated on the underside of the mount and side your tube in to position. 2. Simply re-tighten the grub screws to secure tube firmly in position. To finish open tube ends neatly you can add a stylish Tube End Cap. Square Stainless Steel Tube for bar rail fittings. In-Line Connector for joining square tube sections. 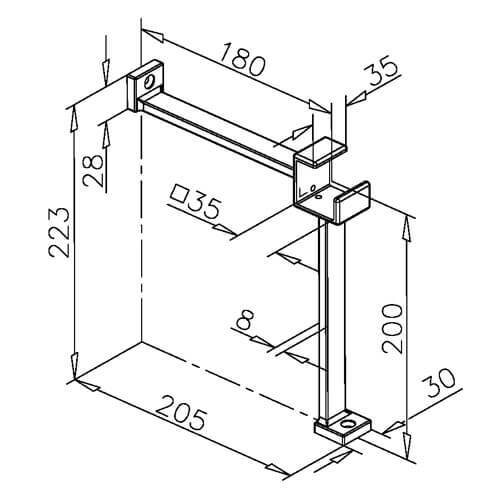 Corner Connector for square bar railing. Tube End Caps for the perfect finishing touch.